Etymologically, calving is cognatic with calving as in bearing a calf. In October, 1988, the A-38 iceberg broke away from the Filchner-Ronne Ice Shelf. It was about 150 km x 50 km. A second calving occurred in May 2000 and created an iceberg 167 km x 32 km. A major calving event occurred in 1962 to 1963. Currently, there is a section at the front of the shelf referred to as the 'loose tooth'. This section, about 30 km by 30 km is moving at about 12 meters per day and is expected to eventually calve away. The largest observed calving of an ice island happened at Ward Hunt Ice Shelf. Sometime between August 1961 and April 1962 almost 600 km2 of ice broke away. This large ice shelf, located in the Weddell Sea, extending along the east coast of Antarctic Peninsula, consists of three segments, two of which have calved. In January 1995, the Larsen A Ice Shelf containing 3,250 km² of ice 220 m thick calved and disintegrated. Then the Larsen B Ice Shelf calved and disintegrated in February 2002. Photographer James Balog and his team were examining this glacier in 2008 when their cameras caught a piece of glacier the size of the Lower Manhattan fall into the ocean. The calving event lasted for 75 minutes, during which time the glacier retreated a full mile across a calving face three miles (five kilometers) wide. Adam LeWinter and Jeff Orlowski captured this footage, which is featured in the film Chasing Ice. First conceived in 1995 by Ryan Casey while filming for IMAX, this sport involves a surfer being towed into range by a jet ski and waiting for a mass of ice to calve from a glacier. Surfers can wait for several hours in the icy water for an event. When a glacier calves, the mass of ice can produce 8 metre waves. Rides of 300 metres lasting for one minute can be achieved. ^ Glossary of Glacier Terms, Ellin Beltz, 2006. Retrieved July 2009. ^ Glacier Bay, National Park Service. Retrieved July 2009. ^ Glacier Calving photos. Retrieved July 2009. ^ ARCTIC, Vol. 39, No. 1 (March 1986) P. 15-19, Ice Island Calvings and Ice Shelf Changes, Milne Ice Shelf and Ayles Ice Shelf, Ellesmere Island, N.W.T., Martin O. Jeffries, 1985, University of Calgary. Retrieved 18 July 2009. ^ Oceans, Oxfam. Retrieved June 2009. ^ Promotions/Public Relations (2006-12-08). "The loose tooth: rifting and calving of the Amery Ice Shelf - Australian Antarctic Division". Aad.gov.au. Archived from the original on October 2, 2009. Retrieved 2010-07-30. ^ "Calving | Define Calving at Dictionary.com". Dictionary.reference.com. Retrieved 2010-07-30. ^ Benn, D.; Warren, C.; Mottram, R. (2007). "Calving processes and the dynamics of calving glaciers" (PDF). Earth-Science Reviews. 82: 143–179. Bibcode:2007ESRv...82..143B. doi:10.1016/j.earscirev.2007.02.002. ^ Nick, F.; Van der Veen, C.; Vieli, A.; Benn, D. (2010). "A physically based calving model applied to marine outlet glaciers and implications for the glacier dynamics" (PDF). Journal of Glaciology. 56: 781. doi:10.3189/002214310794457344. ^ Kohler, Jack (September 28, 2010). "How close should boats come to the fronts of Svalbard's calving glaciers?" (PDF). Norwegian Polar Institute. Archived from the original (PDF) on 2010-09-28. Retrieved 18 January 2018. ^ "Modeling Iceberg Calving From Ice Shelves Using a Stress Based Calving Law: The". Adsabs.harvard.edu. Bibcode:2008AGUFM.C41D..03B. ^ Business Support Group (2009-05-18). "Rifting and calving of the Amery Ice Shelf - Australian Antarctic Division". Aad.gov.au. Archived from the original on September 30, 2009. Retrieved 2010-07-30. ^ ARCTIC, Vol. 39, No. 1 (March 1986) P. 15-19, Ice Island Calvings and Ice Shelf Changes, Milne Ice Shelf and Ayles Ice Shelf, Ellesmere Island, N.W.T. ^ "Ayles Ice Shelf - Dr. Luke Copland". Geomatics.uottawa.ca. Archived from the original on 9 February 2007. Retrieved 27 January 2017. 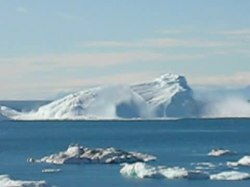 ^ "Video: Largest glacier calving ever caught on film | EarthSky.org". earthsky.org. Retrieved 2017-02-20. ^ McNamara, Garrett. "Garrett McNamara Extreme Waterman". ^ "Glacier Surfing". June 30, 2008. Archived from the original on February 1, 2009. Jeffries, M. 1982. Ward Hunt Ice Shelf, Spring 1982. Arctic 35542-544. Lyons, J.B., And Ragle, R.H. 1962. Thermal History And Growth Of The Ward Hunt Ice Shelf. International Union Of Geodesy And Geophysics International Association Of Hydrological Sciences, Colloque D’obergurgl, 10–18 September 1962. 88-97. Rectic And Maykut, G.A., And Untersteiner, N. 1971. Some Results From A Time Of Geophysical Research Dependent Thermodynamic Model Of Sea Ice. Journal 761550-1575. Wikimedia Commons has media related to Calving glaciers.